I’ve been to Vegas about 7-8 times and I’ve stayed at the Palazzo, the Venetian, Caesars Palace, Vdarra, Aria, and the Trump hotel as well as the condos at the Palms casino. I’ve also seen rooms at the Cosmopolitan and Treasure Island so I feel like I have a pretty good idea about what’s available. We decided to stay at a vacation condo called the Jockey Club which actually turned out to be amazing! We had a 2 bedroom, 2 bathroom condo with a full kitchen, and a large living room with 2 couches that people could sleep on. It ended up costing us about $80 each so it was super affordable for the weekend. The VRBO link I used above was half the price of the guys’ condo in the same building that they found on Airbnb. I would absolutely stay at Jockey Club again it was in between the Cosmopolitan and the Bellagio fountains it was perfect. You also get access to the Bamboo pool at the Cosmopolitan which is a really nice chill pool (not a raging pool party) if you’re in the mood to relax. I basically alienated myself from the entire group when I told everyone in a group text that just in case they’ve never been to Vegas before, they need to be prepared to do full glam like hair done, full face of makeup, and heels even for a pool party. I think when they met me they understood that I had good intentions and saw first hand the benefits of being dressed up. Being in full glam means you’re always ready for whatever Vegas throws at you and you never have to worry about getting into a club or pool party. It’s also insanely hot in vegas so a short dress is going to keep you nice and cool. You don’t have to spend a billion dollars either. I wore dresses from Forever 21 both nights. I get tons of compliments on this black one and it’s still available and less than $25! I wore a day dress to brunch from Lulus (and of course my shopping/hangover/road trip home Adidas outfit). I wore these MICHAEL by Michael Kors ‘Josephine’ Wedges which are on sale for $149.90 and are super comfortable. Friday night we headed to the classic Thunder from Down Under which is Australian Magic Mike. It’s a super fun entertaining show that I highly recommend (especially if you can get discounted tickets). It was my second time and I still loved it. Between traveling, pre-gaming, Thunder from Down Under, and dancing in our hotel room we were all way too beat to go out Friday night and stayed in. Vegas has this strange thing where club promoters walk around all day and will approach you and invite you to their club. They will look sketchy as hell and it will feel like they’re hitting on you, but rest assured they are typically legit and are very helpful in getting you in where you want to go. I read this whole article about Marquee which is a mega sized club and how they have to fill it every night so they have promoters invite hundreds of people and offer them free entry and drinks if they get there early. That way when the VIPs who paid thousands for their bottle service arrive, the club does not look dead. If no one approaches you and there’s a specific club you want to go to, post a really good selfie or group pic and tag #Vegas as well as the clubs (or pool parties) you want to go to or similar clubs. Hopefully a promoter will find you and invite you to the party. If not just use the ones that commented on my pics @rickysurrendervegaswaters @johngardnerwetrepublic. I have no idea where I first came up with this weird idea, but I was obsessed with getting a “pool gown” to wear to the pool party. I surprisingly skipped the falsies because it was about 110 degrees outside, but feel free to pop some on. No matter how glam/dressed up/over the top/crazy you look, someone will always one-up you and that’s part of the fun of Vegas so just go for it! I found this full length beauty at a boutique on Melrose called Eden Sky. One of the girls got a promoters number and texted him to get us on a list for the Marquee pool party at The Cosmopolitan. He told us we had to be there before some super early time (1:30pm I think?) so I made everyone go in their hungover brunch clothes, we got our wristbands, then we left after about 2 minutes after getting in to go back to our rooms and change into proper pool party clothes. This totally worked and we didn’t have to wait in line! I’ve also been to Wet Republic at MGM and had an awesome time too. When we were at Marquee Day Club a security person asked if we wanted to join someone’s cabana and it ended up being a guy the bride had dated 10 years ago! Luckily they were on good terms so we all got to party and have fun together. Saturday night we went to a club called Surrender which is an indoor/outdoor club that’s really gorgeous. 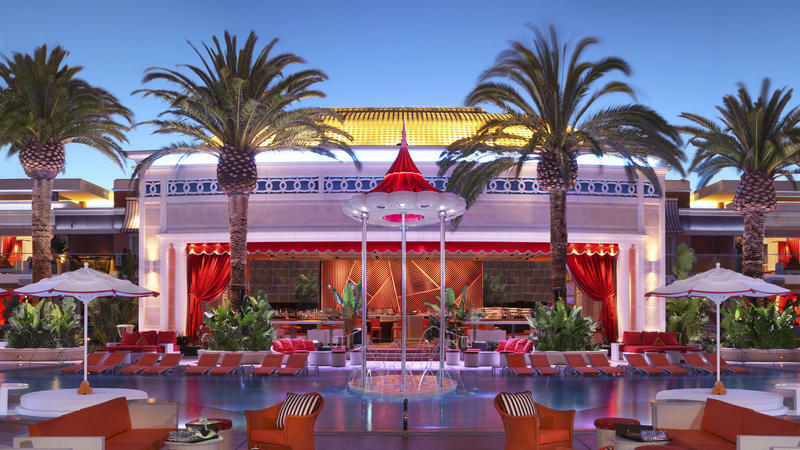 I also love Xs nightclub at the Wynn. We went to see DJ Snake and the bachelor party guys had already bought express entry tickets online so we went in the same line as them. When we got to the front they made us 4 girls buy tickets too for ~$30. If I were doing this over again I would have gone on Instagram a few days before and found a promoter to get us on a guest list to avoid paying (but I really hate paying for nightclubs in general). Always gamble with someone else’s money if possible. This is the best way to gamble. Sit at slot machines and pretend to play to get free drinks. When I’m feeling fancy I order champagne. If I’m sick of drinking or tired I order a water or Red Bull. Be sure to tip the cocktail waitress. The food in Vegas is freaking incredible. One of my favorites is the Secret Pizza place at the Cosmopolitan. We also waited in the long line for Eggslut (get the cookie!!) The struggle of wearing a bikini and/or body con dress everyday when the food is so good is real. Drink lots of water, take aspirin before bed, at the very least wipe your face off with a makeup wipe and moisturize before you pass out because you in the desert girl! Having Uber in Vegas is amazing. I do not miss waiting in cab lines. Wear lots of sunscreen all day everyday! The casinos are chilly so bring a light jacket if you get cold easily. The Sephora in the Forum Shops at Caesars Palace is one of the best in the country. This one and the one at the Hollywood and Highland Center in Los Angeles tend to have the best selection of limited edition products.